Participants will receive more detailed arrival information closer to the Institute, but as you make your travel arrangements please note that on-site registration will take place from 9 - 11:30 am, and all participants should plan to arrive on campus during the registration window. From the North: From I-91 South, take exit 25 in Deerfield. At the end of the ramp, turn left and follow the road to the intersection. Turn right onto Routes 5 & 10 South. Go 1 mile, then turn left onto Route 116 South. Follow Route 116 South for 8 miles to the UMass exit. From the East: Take Route 2 West to Exit 16 (Belchertown/Amherst). From Route 2 take Route 202 South for about 15 miles to a blinking yellow light at Amherst Road. You will see signs "to Route 9/Route 116". Turn right and follow Amherst Road (which becomes Pelham Road) for 7 miles to Amherst center. Follow signs to UMass. From the South: From I-91 North, take Exit 19 in Northampton. From the exit ramp, turn right onto Route 9. Travel approximately 4.5 miles to Route 116 North. Turn left at the traffic lights to merge onto Route 116 North. Take the UMass exit in 1 mile. From the West: Take Route 2 East to the Greenfield/I-91 exit. Take I-91 South to Exit 25, Deerfield. At the end of the ramp turn left and follow the road to the intersection. Turn right onto Routes 5 & 10 South. Go 1 mile, then turn left onto Route 116 South. Follow Route 116 South for 8 miles to the UMass exit. From I-90 (Mass Pike): Take Exit 4 (West Springfield). Follow I-91 North to Exit 19. From the exit ramp, turn right onto Route 9. Travel approximately 4.5 miles to Route 116 North (turn left at traffic light). The UMass exit is 1 mile up. If you are traveling to Amherst by plane, the closest airport is Bradley International Airport, located in Windsor Locks, Connecticut (right outside of Hartford). This airport is approximately 45 miles south of the UMass campus. While you may find more flight options to Logan International Airport in Boston, Massachusetts, Logan is approximately 90 miles east of the UMass campus, so if you book a flight to Logan please allow for extra travel time to UMass. Both airports feature car rental agencies and a variety of shuttle services, including Valley Transporter (413-253-1350), Seemo Shuttle (413-586-1120), Exclusive Car Service (877-695-4665), Bluebird Transportation (413-221-4512), and Michael's Limousine & Transportation Service (413-583-6392). Be sure to indicate that drop-off and pick-up is to/from the Commonwealth Honors College dormitories. The Amherst area is serviced by Greyhound, Peter Pan Bus Lines, Megabus and the Pioneer Valley Transit Authority (PVTA). For Greyhound, Peter Pan, and Megabus, we recommend using "Amherst UMass, MA" as your destination instead of "Amherst Center, MA", if at all possible. The Amherst Center stop used by these bus services is about 1.5 miles from the UMass Campus and it will require some additional planning to get to campus by PVTA bus, taxi, or foot. The Amherst UMass stop, however, will bring you right to Haigis Mall, located on the UMass Campus. The Residence Hall is about a 10 minute walk from this bus stop. For PVTA buses, we recommend taking a look at the various routes and schedules available on the PVTA website. You may also want to use the PVTA Google Trip Planner, Where's My Bus?, or PVTA Bus Tracker App to help you plan the best route for you. Please be sure to carefully review bus schedules, bus stop locations, and campus maps prior to your arrival as both the area and the campus can be confusing to navigate if it is your first time here. If you need any assistance planning your trip, please let us know! Amtrak provides passenger rail service to nearby Northampton, MA, located a 20 minute drive from the UMass campus, and Springfield, MA, located a 30 minute drive from the UMass campus. For schedule information and to purchase tickets, visit Amtrak's website and select "Northampton, MA (NHT)" or "Springfield, MA (SPG)" as your arrival destination. If you take a train to Northampton, MA, you will be able to take either a bus or taxi to the UMass campus. Both PVTA and Peter Pan buses service the area, but the bus stops are not located at the train platform and will require about a 7 minute walk. If you prefer, you may use one of the many local taxi services. It is a 40-minute bus ride on PVTA public transit ($1.50) to UMass Haigis Mall, which is then a 10-minute walk to the residence hall. A taxi ride from Northampton to the UMass campus costs around $40. We encourage you to carefully plan your trip— including bus or taxi services—prior to your arrival, as the Northampton train platform is not a full train station and phone access, area maps, bus schedules, and bus tickets will not be available once you arrive. If you decide to take a train out of Northampton, remember to purchase your return ticket online prior to arriving at the platform. The train platform is located at 170 Pleasant Street in Northampton, MA. If you take a train to Springfield, MA, we recommend booking a shuttle service, such as Valley Transporter, to get you from Springfield to Amherst. Bus services, including Peter Pan, are also available, but will require about a 15 minute walk from the train station to the bus stop. The train will arrive at the Springfield station building, located at 66 Lyman Street in Springfield, MA. This station building does have a waiting room, ticket office, quik-trak kiosk, and payphone, but we do still encourage you to plan your trip, including services from the train station to campus, prior to your arrival. You will be provided with a free parking permit for a lot adjacent to your residence hall at check-in. Attendees with a valid state-issued reserved accessible license plate or placard may park in any marked Handicap Space or any nonrestricted, nonreserved space or lot, at no charge, as long as your plate or placard is clearly displayed at all times during your stay. 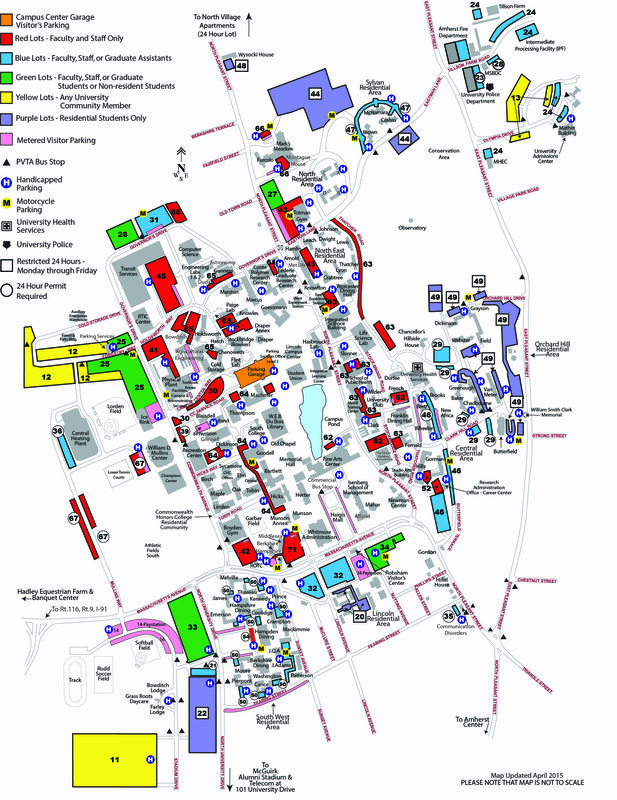 To locate reserved accessible parking, take a look at the UMass Parking Map, select the blue parking icon on the right, and click the "Handicapped Parking" option. You should not park at UMass without first obtaining a valid permit as detailed above: parking on campus without a valid permit, pass, placard, or license plate will result in ticketing and/or towing.